Each day is full of possibilities, and Zoe wants to be ready for everything this one might bring. But that makes getting dressed really, really hard! If it's a twirling day, she'll need to wear the purple skirt. But if it's a cartwheeling day, she'll want the polka-dot tights. Or it might be a hiding day, perfect for the flower crown that will help her blend into the garden . . . or a flying day, which demands butterfly wings! As the clothes pile up and Mama tells her it's time to go, there's only one way Zoe can be sure she's prepared for all the adventures ahead -- a solution that will have parents laughing in recognition and kids nodding in satisfaction. 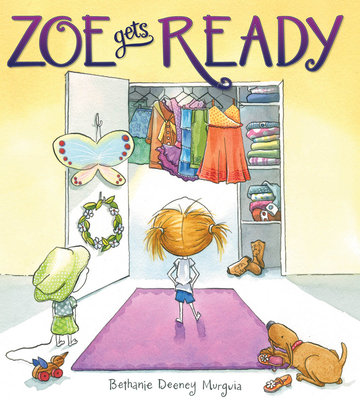 Zoe Gets Ready is perfect for all those little girls who wouldn't have things any other way.